It had been a long and busy day of meetings and deadlines, and as the workday drew to a close I remembered I needed to check my email. Once I did, I wished I had checked earlier, because among the various email titles talking about last-minute Christmas shopping deals and notices, two words stood out which demanded my attention. My cousin Kathy is not generally given to such use of expressive titles, being the levelheaded and quite sensible person that she is, and I immediately opened the email and began to scan the rather lengthy explanation supporting her subject…and then I saw, and understood, what she was revealing. She had found her father, or at least a very important part of him, that none of us had known existed. Let me try to explain and I hope you will bear with me as I tell you the story of my Uncle Mack, a man who has appeared a times in the pages of The Literate Pen but not in the great detail I hope to share in this posting. Just as a nephew, it is hard to put into words the impact Uncle Mack had on my life, so as you read a bit about him, you’ll understand that the impact is far greater for that of his children. I was born in 1966, and though I have a large extended family, my immediate one has always been quite small. My father and my mother only had one sibling each, so I had only as many aunts and uncles as I did grandparents. These eight people were the major adults in my life outside of my parents and each, to one extent or another, had some kind of impact on my life. By the time I was twelve years old, both uncles and one grandmother had passed on, and both uncles were in their prime when they left us. My uncle Charles, married to my mother’s sister died when I was three and I honestly can only remember sitting in his lap and tugging on his wristwatch with its twist-o-flex bracelet. My grandmother on my father’s side died when I was twelve and I fortunately have many fond memories of her, seen through the eyes of a child. Those memories endure but are locked into a past that didn’t change much as I grew into an adult. Uncle Mack was different though, because of the seeds he planted in my mind at such a young age, and because I grew to appreciate them more and more as I grew older…and because of who he was and the legacy he created, I realized he had an impact on many things that endure to this day. Uncle Mack was a Moon Man, one of the many people who put human beings on the moon in 1969, and he fired my imagination about the moon, rockets and space from the time I was very small. He and my Aunt Jeane lived in Huntsville, Alabama with their three daughters, my first cousins, all of them older than me but not so much older that I didn’t form bonds with them that have lasted to this day. At that time, he worked for the Marshall Space Flight Center and although he had some fancy title that went along with that, all I knew was that the work he was doing was with astronauts and space programs, and there was no greater thing to a small boy in the late 1960’s and early 1970’s than astronauts. I was a frequent visitor to Huntsville in those days. A flight from Atlanta was less than 30 minutes and my parents would put me on a plane and send me over every time my aunt and uncle decided they wanted me to come over. The stewardess would keep up with me for the short flight and they would always be waiting at the airport to get me when she brought me off the plane. Uncle Mack would often make the best use of our time together by taking me to where he worked, to see all the cool stuff going on and we would have long conversations about rockets, space flight and the moon. In addition to toy rockets and children’s books about space, he gave me his knowledge, not from the point of view of a highly trained rocket propulsion engineer, but imparted in such a way that a 3-year-old could understand it. He used one of his many tennis balls to explain the concept of gravity to me and other implements he could find to explain the processes of rendezvous in space, where two spacecraft link up together, such as was pioneered in the Gemini space program. Most importantly, he explained in great detail how all this was going to work with Apollo, the most important space program every envisioned, the project that was going to land astronauts on the surface of the moon. Like a sponge, I absorbed and remembered everything. Unlike today, I had a great capacity as a child for remembering things I was told, and as I played with my toys, many a moon landing in deep shag carpet took place. It was no doubt all of those lectures and demonstrations that helped me to remember watching the moon landing when it finally took place in 1969. My mother made sure I was there to see it and she told me to remember it. It was probably the first exciting moment of my life. What I don’t remember, but what she has told me many times since was that as things were happening, I was explaining to my parents some of the stuff going on on the television. One thing was they kept mentioning the word LOX, which my mother thought was something that went with bagels. When she questioned aloud what it was, she said I turned around and simply said “Liquid oxygen mother” and went back to watching the TV. 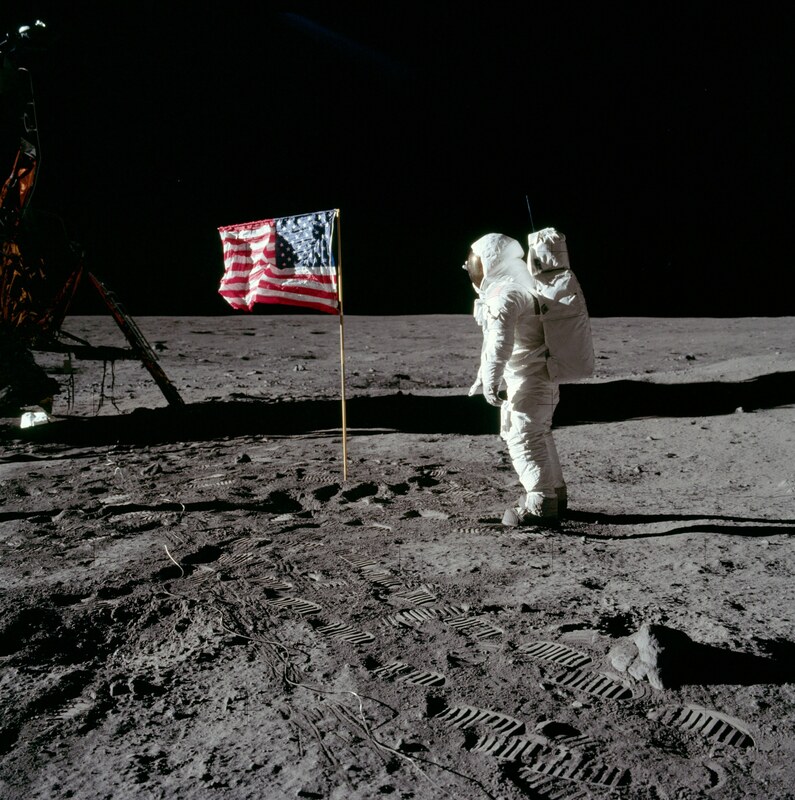 My grandmother actually took a picture of the TV screen when Armstrong stepped onto the surface, which is preserved in a Kodak carousel of slides to this day. This led to a whole new chapter in my relationship with Uncle Mack. On subsequent visits to Huntsville, all I could talk about was the moon landing and the ones that were following it. 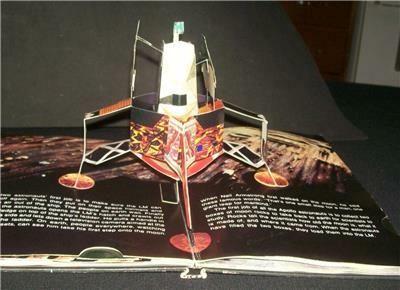 Uncle Mack gave me a cool pop-up book (these were big in the 1970’s, because as you turned the pages, things would “pop up” in 3 dimensional format) that chronicled the event, such as the LEM (lunar excursion module) on the surface of the moon. I literally wore that book out and it was my favorite for a long time after. Though I am more quiet and reserved as an adult, I was a complete chatterbox as a child and Uncle Mack never seemed to mind the endless questions and talk, always explaining and encouraging me to ask more and more. I also came to understand that he spoiled me pretty badly when I visited, based on conversations with my cousins, my parents and my Aunt Jeane, who did a lot of the spoiling herself. There was nothing more fun than cruising down the highway with Uncle Mack at the wheel of his big green Mercury, stopping by the Dairy Queen for an ice cream cone (literally the cone, not the ice cream) or pedaling along beside him as he went on his morning runs. Uncle Mack was a physical fitness guru before it was cool and it was through him that I had my first taste of Gatorade, the drink of athletes, and Tang, the drink of astronauts. He also loved tennis and usually within an hour of my arrivals in Huntsville, his large bin of tennis balls would be all over the living room floor. He never seemed to mind. Our last conversation was on a visit in the fall of 1973. As I remember, he wasn’t taking me back to the airport on that trip because he had to take my cousin Suzan to Tuscaloosa, where she was attending college, and my Aunt Jeane was going to take me. In that conversation, probably to steer me on past Apollo and into the future, he told me about the new spacecraft that was being developed and what all it could do. He called it an orbiter and said that it would go up like a rocket and land like an airplane and could be used again and again. I left Huntsville, full of wonder about what was to become the Space Shuttle, not knowing I would never see him again. It seemed a cruel twist of irony that someone who adhered to such a strict physical fitness regimen should die at such a young age but around Christmas of 1973, he became ill and was diagnosed with pancreatic cancer. A month later, on January 14th, 1974, he was gone, and for someone who could comprehend how manned space flight worked so easily, death was not something an eight year old could grasp. To say I felt his loss and the growing knowledge that I would never see him again in my life was truly an understatement. Every young boy needs someone to look up to, to admire and to even give a bit of hero-worship to, and oftentimes our own fathers don’t fit that bill because they just got up every day and went to work. I will say that I didn’t appreciate my Dad for doing that until I was old enough to understand what he did and why he did it day in and day out. For me though, Uncle Mack was that person, and in death he attained a stature that might not have been had he lived long enough for me to realize that he was a human being like most others, complete with faults and failings. Years went by, and I still visited Huntsville occasionally but it was never quite the same, for me or for his family. My cousin Kathy came over to Georgia to go to college in Macon and frequently stayed at our house on the weekends, a surrogate sister and baby sitter for my brother and I. She and I would frequently talk about her father, though I know it made her sad at times to talk about him. Their loss of a father was far greater than my loss of an uncle could ever be, but through my remaining close to them and my memories of him, he was still there in some ways. His daughters grew up and had families of their own, including six children who I watched grow from children into adults through periodic visits over the years. During the past twenty years, we made it a point to all get together at least every other year for a weeklong visit to the Alabama Gulf Coast, a place their own father had taken them as children; in fact, this most recent trip in July to the Gulf saw four generations present, consisting of 35 people spread over 5 condos for a week. Uncle Mack never got to see any of his grandchildren but I see resemblances in them, both physical and otherwise. They have always been curious about him, this unknown grandfather who helped send 12 men down to the surface of the moon, and they grew up hearing the stories about him and seeing his image in a large collection of pictures that have been lovingly cared for by his children. Still, they had never seen a home movie, or heard his voice and there were now only five of us in the family that could still remember what he sounded like. Several years ago, I began to google his name, hoping to learn more about what he actually did in the Apollo program, and sure enough, there were references to him in many places. I also had a copy of his Master’s thesis from Georgia Tech, a degree he went back to Georgia Tech to get at the behest of NASA while he was working on Apollo in its earlier days. I didn’t understand a lot of it though…Uncle Mack might have communicated to me on one level but his writings were to a completely different audience of people, those learned in the field of logistics, engineering, rocket propulsion and science. The well soon ran dry but every now and then something would remind me of him and I would renew the search, occasionally turning up new things that had been uploaded to the growing internet. Apparently, my cousin Kathy liked to do this too, and she had found many of the same links and documents that I did. I was surprised to find on one of the more recent explorations that he had filed for and been granted a patent on, of all things, a table that was developed and used at NASA. Seeing all the report and writings that had attributed Uncle Mack as a contributor, I thought it was a terrible shame that some of his interviews had never been recorded. To be able to hear his voice again would have been the ultimate treat for me but there was never anything to indicate that such recordings existed and I had resolved to myself that I would always have to rely on my memory of his voice and what it sounded like. Last week, Uncle Mack’s oldest grandson reached out to the four of us by email with questions about his grandfather. John, now in his early 30’s, is an engineer himself, working in many of the same disciplines as Uncle Mack, and it seemed he was going to have the opportunity to meet and talk with someone that had worked with him in the space program many years earlier. We all chimed in with what we knew, the physical facts and job titles and descriptions of what he did, gleaned from both personal knowledge and facts collected in the many years since his death. I added my own reflection to the facts, because I really wanted to impart to him the importance of what his grandfather and those who worked with him had done. Though it was written to him, I think I should include it here because it sums up in a few words the appreciation I had for Uncle Mack and all the “Moon Men” that put Apollo on the moon. I wrote “The critical nature of the work that he and his associates did was nothing short of incredible. Individually, he would have stood out unbelievably; collectively, they were akin to staffing a symphony orchestra with every notable composer from Bach to Wagner…kind of hard to stand out in that kind of crowd but at the end of the day what they could do together has not yet been matched and may never be again. If you learn nothing else of him, know that he played a very important role in the history of mankind’s greatest feat of scientific achievement”. I really thought that would be the end of it, but there was more to come. Ever the sleuth, and leaving no stone unturned, cousin Kathy began pouring through the internet again to look for new information, and what she found this past week led to the moment we all had to “prepare ourselves for”. On a website hosted by the University of Alabama at Huntsville, buried among countless other entries was a report, commissioned by NASA and written by a Dr. Roger Bilstein in the early 1970’s, called “Stages to Saturn”, a history of Apollo and the creation of the Saturn V rocket, the big one that Uncle Mack and others worked on. I had seen this report before and knew that he had attributed Uncle Mack and many others for helping with this report, mentioning interviews with him in the back of the docket. What I didn’t know, and what Kathy had found, was that these interviews had been recorded and were now online for anyone to hear that wished to. To this point, I’ve written 2694 words just to explain what led up to the moment of finding and opening that email and I had to sit down for a moment and take it all in…and try to grasp the knowledge that finally, after 43 years of silence, Uncle Mack was going to he heard again and I could hardly wait. I clicked through the link, certain that it would be some scratchy old recording that would be barely audible. Boy was I wrong…I guess NASA had much better equipment than most folks had in their homes in 1973, because for the most part, except where he wandered away from the microphone, it was clear, it was crisp, and most importantly to me, it was him. Just as I remembered him, except I had never noticed how pronounced his southern accent was. He might have been a highly degreed, experienced engineer, but he was still a southerner, born and raised in Mississippi, educated in Georgia and employed for many years in Alabama. Four recordings of him, averaging about 20 minutes apiece, detailed the work, the staggering logistics of and the daily challenges of putting together a space program that few today think much of in this age of handheld computers and iPhones. He talked about all kinds of things, both mundane and fascinating and I quickly came to realize that all of our conversations together had been the end product of all kinds of things that I could have never grasped then and can hardly grasp now. Computer printouts that were “umpteen inches thick” and which had to be gone through meticulously…developing a system whereby people could teleconference in through phones in multiple conversations, something we do everyday now at the push of a button…and even all of the work that went into designing the conference room that the engineers of Apollo would meet in to look at “slides” and “viewgraphs” on the wall, the precursor for PowerPoint. This was stuff we take for granted now that was developed by these people to make their jobs work better. I can’t express adequately in words what it meant for me to hear my uncle’s voice again after four decades, but even more importantly, to hear of the world he inhabited each day, of the things they did to make that program work, told from that time and from his perspective. If they needed something and it didn’t exist, they invented it, right there on the spot. Innovations and patents ran forth each day like rain from that office and other space-related offices all over the country, for years, until they achieved that one single objective…to land two men on the surface of the moon…and there was Uncle Mack, my childhood hero, right in the middle of it all. That recording was made on July 27th, 1973, less than six months before his death. It has been an emotional reunion for all of us with him, but also a very enlightening one as well. It also turned out to be one of the best early Christmas presents I’ve ever gotten because it has given me the chance to reconnect with him in a way I had given up on ever having again…to hear him, to experience his thoughts and his feelings and to know that he really did have that excitement for what he did, that he passed along to me. He, more than anyone, shaped certain paths in my life because of my love for everything space related. My fascination with science fiction and documentaries about the space race and the moon program. Reading James Michener’s epic classic “Space” and rewatching Ron Howard’s “Apollo 13” at least once a year. Trips to Marshall Space Flight Center and Kennedy Space Center. Learning about and using computers when they first came into the schools, which is probably why I am so adept with them today. Computers went hand in hand with space exploration and that definitely played a part in my interest in them. Learning and understanding things, wanting to know how they work. Uncle Mack fueled all that during the most formative years of my life. What is really amazing about the space program of the 1960’s though is that it forced us to push ourselves and our technology much harder and faster than we would have likely done otherwise and the sheer number of inventions and innovations that resulted from that one massive drive forward influences us to this very day. As I wrote to my family the other day, “because of Apollo and the work Uncle Mack (and his cohorts) did to advance the boundaries of science and technology, we took a huge leap in developing things we otherwise would not have had for many more years into the future from that time, if at all. Things like email and the internet, which led to the Cloud and to Google and Facebook. Talk about the chicken and the egg concept…in some ways, he enabled and advanced the very technology that would someday allow us to hear from him again after 43 years, and in doing so, he spoke to a future that he himself would not see”. I think that sums up a lot of what I’m saying here…and because of what they did, I enjoy technology that even the space age didn’t imagine, yet they laid the foundation for it…and my uncle opened the door to that world just a bit and showed it to a young child with a big imagination and it left an imprint. Roger Bilstein, in his final report, summed it up in terms we can all understand and marvel at. He said “the Office managed the efforts of 100,000 people, working on a project that cost more than 2.5 Million a DAY for 8 years…involving 12,500 companies located in 47 states”. I think that should stagger the mind of most, and they did it with less computing power than a MacBook has today. On one final note, I want to say thank you to the staff members, whoever they are, at the University of Alabama Library, Archives and Special Collections Department and Director David Moore. You probably came across an old box full of dusty Dictaphone reel tapes, made decades before some of you were born, and you took the time to convert them to digital media and put them out there for the world. You may not have thought they were very important, but you should know one thing…your work made a handful of people, yearning to make contact with a voice from their past, very happy. Never underestimate the importance of preserving the past so that it can speak to those in the future. Thank you for that early Christmas present. Original “Moon Men”, Marshall Space Flight Center. Mack Shettles is 4th from the left. 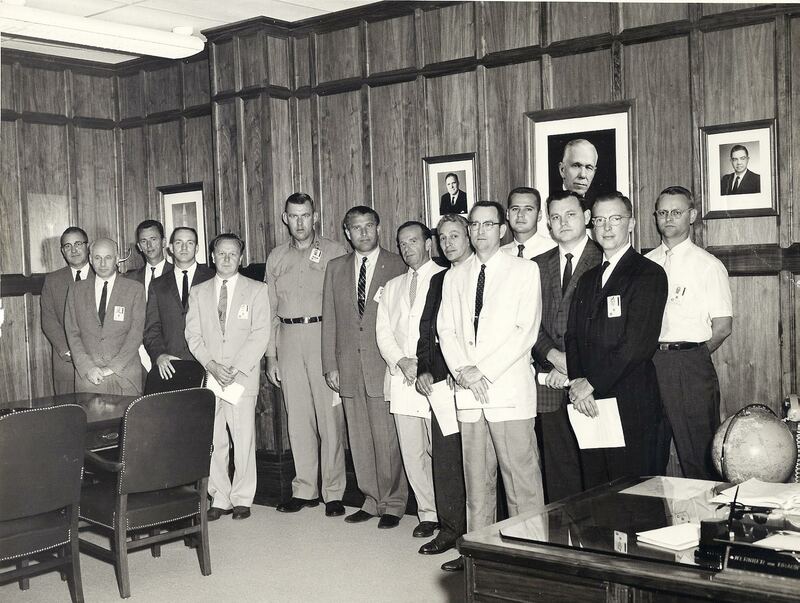 Werner von Braun, Director of MSFC is 7th from the left. You are incredibly fortunate to have found these recordings! But you are even more fortunate to have such clear memories of your uncle. I’m about your age, and I have the dimmest memories of a great-grandmother who died in 1972 — someone I saw at least weekly. You bring up some outstanding points about how the audacious goals these men chased brought about incredible creativity and inventiveness. It’s a shame we have no audacious national goals today. Thank you Jim…it sounds like you had a unique and special relationship with him…and you are right, we need those “audacious goals” again, to unite us and to move us forward to the next big thing. I refuse to think that we as a civilization crested in 1969 but I wonder sometimes. Thanks for your kind words as always! This is probably my favorite post you’ve written. I loved hearing about my grandfather and wish I could have met him. Thank you so much for sharing your memories for me to pass on to my children as well! You’re very welcome! He was one of a kind for his era and it was really awesome to hear him in his own words again.